Except where citations exist to the contrary, all information contained on this web page is ©2000 by Russ Shade and High Spirits Aviary. No part of this information may be published in any format without the express written permission of the copyright owners. In 1993, Dr. Mauro Galetti, a Brazillian zoologist, published a paper titled Diet of the Scaly-headed Parrot (Pionus Maximiliani) in a Semideciduous Forest in Southeastern Brazil (Biotropica 25(4), 1993, pp 419-425 ). To the best of my (and Dr. Galetti's) knowledge, this was the first peer-reviewed research paper published about the diet of any Pionus species. Because most species of Pionus parrots live in similar conditions, the information contained in this paper is an important resource for any Pionus parrot owner. Let's spend a few minutes looking at the study site and the study methods Galetti employed. Galetti did this work at Santa Genebra Reserve - a 250 hectare area with a fragmented subtropical moist forest - similar to the subtropical cloud forest where we did our preliminary BW study. The forest was fragmented in the 1950's and is surrounded by corn and soybean plantations. This information is important to because it helps us understand the significance of the composition of the Pionus' diet. We'll talk more about that in a minute, but first, let's look at one more graph. Now the more interesting information is apparent. We can safely conclude that Pionus parrots consider more than simply what's available when they make their food selections. Note that both flower and leguminous fruit consumption do NOT parallel the periods of greatest availability. Pionus diet includes a very high percentage of seeds - in fact, at least 3 times more than most avian nutrition writers recommend. Even though protein-containing leguminous fruit is available year-round, Pionus parrots eat it increasingly frequently as breeding season approaches. When we look at what specific flowers and fruits are eaten during this period, we find that guava is the main food source - and guava nectar from the flowers contains protein as do the guava fruits.Post-breeding, their protein consumption drops to less than 1.6% of their diet, but begins to increase in January - perhaps in preparation for the next round of breeding. We do not yet know if other Pionus species follow this same pattern, though feeding trials being conducted in our aviary are beginning to suggest that a similar pattern serves these birds well. We will continue to pursue this information in our work in Ecuador. Let's take a look at some more details about what Pionus parrots consume. It is not known where the parrots can obtain enough lipids. of parrots and parakeets in a lowland Atlantic Forest of Brazil. Maxi's eat these seeds in the forest canopy and they usually consume the fruit that contains the seeds as well. For example, fruit of the Inga is known commonly as guava. In our work in Ecuador, we noted that Bronze-wingeds eat heavily off Inga as well - the species there are Inga silvestre and Inga machetona. If you are looking for a natural food to feed your Pionus, start buying (or growing) guava - they eat the flowers, the fruit, and the seed. It is the foodsource most frequently eaten by Maxi's and BW's. However, what we are calling guava here is not the same thing you see in the supermarket with the same name. We'll talk more about guava later. Both Stoodley and Galetti report seeing large groups of Pionus parrots eating corn. They both mention that agriculturists regard them as pests. While I don't doubt that Pionus frequent cornfields, I do question whether they are the notorious corn-eaters they're made out to be. We rented a cornfield in Mindo as an observation site and had a blind erected in the 4' high underbrush growing between the rows of corn. The corn was harvested during our stay, so there is no question that the corn was ripe. From what we could observe, approximately 10 percent of the crop was "ruined" by Pionus parrots. Yet during almost 60 hours of direct observation, the parrots were actually "in" the corn only twice. 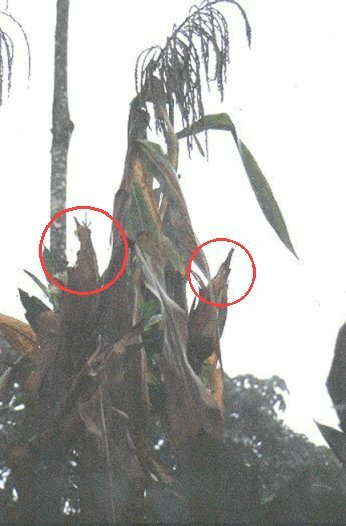 The farmer left behind the ears of corn that had been eaten by the parrots. Let's take a look at what kind of damage they did. 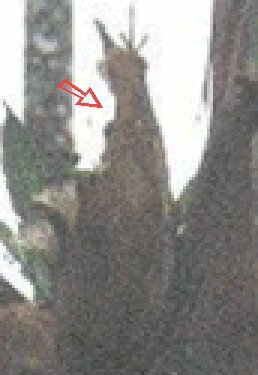 In addition to the ears left on the plants, there were many ears left on the ground - free food for the parrots - yet the parrots never touched either source. I question the presumption that Pionus are "cornhogs." In experiments in our aviary, the parrots enjoy sweet corn and unripe field corn (both are soft), but we have had disappointing results when feeding them ripened field corn - the very crop they are supposed to love. 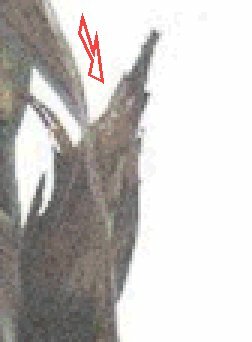 However, it's possible that the parrots are after corn grubs - worms that enter at the top of an ear of corn and eat a path down to the bottom. We found no evidence of any corn grub damage on any of the ears remaining in the field even though it's a common pest. More fieldwork is required before this theory can be presented as fact. However, it is intriguing to note that our friend the corn grub is well known to be one of the main carriers of aspergillus - a fungus responsible for a condition known as aspergillosis. Aspergillosis infections are dangerous to parrots. But even more interesting is the relationship of the condition to Bronze-winged Pionus parrots. When BW's were imported to this country, a good many fell victim to aspergillosis. Some aviculturists surmised that BW's came from high, dry locations and thus were particularly susceptible to aspergillus spores when they moved into the more humid quarantine stations in the southern US. In fact, if you look at some of the tried-and-true parrot guides, you can still find mention of how common the disease is in BW's. I don't think the explanation is that simple. First, I know personally (as do many, many South American farmers) that BW's inhabit cloud forests - not exactly the dry climate they're described as inhabiting. And when we went to higher elevations (above 1600m), we didn't see any BW's. Second, even when presented with a field of ripe corn, the BW's we observed just plain weren't interested. Is it possible that BW's and other Pionus parrots are really after the high-protein corn grubs? If that's the case, then these parrots are NOT the agricultural pests that they're made out to be, but instead, an important assistant for corn farmers. Certainly it's unfair to claim that this information is fact. Much more observation needs to be done to confirm that grubs are really what the Pionus parrots are searching out. Note: Guava is what this food source is called in Spanish. It is NOT the same thing as the guave fruit that we speak about in North America. That fruit is referred to as guayaba by Spanish-speaking cultures. There are literally dozens of varieties: Galetti observed Maxi's feeding heavily on three species - affinis , uruguensis , and luschnantiana . In Mindo, the Pionus parrots feed on silvestre and machetona . Galetti says the parrots eat the flowers and fleshy fruit of this leguminous tree. Unlike may other birds which also eat of the flowers and fruit, Pionus parrots also eat the seeds - despite the somewhat toxic qualities of the seed (leguminous plants and seeds, such as beans, contain secondary compounds, probably to deter seed predators). Interestingly, macaws also eat heavily off Inga. Here are some links to photos of Inga flowers and leaves. Galetti goes on to mention that the parrots eat the Inga flowers so heavily that little fruit is set; only the fact that Inga sp grows so abundantly accounts for the tree's ability to reproduce. What is most interesting is that this type of tree flowers and fruits without any set "schedule," thus the parrots could eat it year round. Yet, according to Galetti's data, they eat flowers primarily from August to December (in advance of their breeding season) and the fruits (seed pods) from September through March, dramatically increasing their levels as the dry season approaches. The seeds themselves are 18.9% protein (by weight) and pods have a protein level of 10-12% (source James A. Duke. 1983. Handbook of Energy Crops. unpublished ).